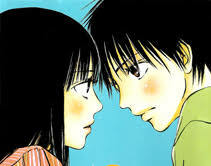 Strobe Edge | Manga Reviews ~ Ramblings of A Fob. The newest addition to Shojo Beat title, Strobe Edge. Its a telling of a story of a girl’s first love. Ninako is a bit of naive but she is sincere, sweet and kind – all around charming if you may. She has never been in love nor has experience the feelings of falling in love. Ninako although doesn’t have a slightest idea of being in love has a childhood boy friend, Daiki. Everyone of their friends wants them to get together as a couple but both of them doesn’t dare to move things farther as being just friends. It’s very apparent to everyone that Daiki likes Ninako alot. Although Ninako just sees him as just friend nothing more. Ninoka’s friends keep on insisting that she should go for him that she half believed herself that she likes Daiki. But as fate would have it Ninako crosses path with Ren. He, as with all the shojo series these days is the ever so popular guy. He’s the idol, the prince charming, everyone admires him, no one has the right to date him so to say the least. In time, both of them shares moment with each other, but its just as an aquintance. We get to see them interact and get to know each other more. But by each time, Ninako starts to wonder what is like to feel in love, her feelings for Ren is growing more than just wanting to be friends. So this series focus much more on the characters interactions which I find the most pleasurable of reading. We get to see Ninako learn and experience first love. I have read a lot of series like this and I still find this series quite enjoyable. Frankly because it does pretty well unfolding the events and it doesn’t have the usual dramatic angst. Its very serene, although the series of events unravels fast the narration of the story moves slowly. The characters in this story is fairly enjoyable and have their good points. Ninako is very typical shojo girl but she doesn’t have the whiny characteristic. She sorts her feelings rationaly before acting on an impulse. I like her she’s very considerate of others. Ren is not your typical silent cool dude since he is caring and compassionate. While Daiki is the ever so nice childhood friend I still like him more so than Ren. I’m being biased here as I like childhood crushes story. I’m rooting for Daiki. Ninako is head over heels in love with Ren at the moment, but I think she’ll soon realize she love Daiki the most. Well thats what I wanted to happen anyway. I’m still not convinced that Daiki is out of the picture. I’m sure implications of change of heart will happen on the latter part of the story. Anyway, here’s hoping for a character driven series rather than the typical filler laden shojo story. Volume 1 of Strobe Edge is a solid start for a series that might become something amazing. Recommended.